When Avenue asked Top 40 Under 40 alumnus, former Breakfast Television and current 630 CHED host Ryan Jespersen to nominate his favourite dish in Edmonton, he mulled it over for quite a while. In the end, though, he couldn’t get away from the first dish that popped into his head: the Angel Hair Sergio at Rigoletto’s Cafe. “From the moment I met [chef] Sergio Turlione, I was struck by his simple, casual, no frills, from-scratch approach to classic Italian cuisine. We’ve had some special nights at Rigoletto’s Cafe,” Jespersen says, referring to wife Kari Skelton, co-host of The Wake Up! Show on Up! 99.3. The dish is comprised of a spicy blackened chicken breast served atop angel hair pasta, with roasted red peppers and a light sauce made with garlic and extra virgin olive oil. Located in the heart of Downtown Edmonton, Rigoletto’s is a hidden gem Italian restaurant that showcases a tasty and diverse menu at ridiculously reasonable prices. Even though Rigoletto’s has a slew of avid followers from its first location on Rice Howard Way, it seems to have fallen relatively out of the Downtown Dining loop at its new location on 103 Street and 100 Avenue. Which is astounding, considering how amazing their steaks are and how much people appear to love them. Owned by Jack Flisiak and Sergio Turlione, Rigoletto’s is a simple yet classic Italian eatery that focuses on the basics of Italian cuisine – and cooks them perfectly. Any preliminary search of this restaurant will unearth a wealth of raving reviews, many of which expound the delights of Chef Sergio’s steak-grilling abilities. The best part, though, is that Rigoletto’s is so reasonably-priced that you can dine like a champion without breaking the bank. Their most expensive lunch entrée is $14.50, while the dinner entrées and pasta dishes range from $9 (for a small) to $29 (for a steak). Their appetizers also meet with critical acclaim and, during this visit, the group of us tried every single one, albeit the mussels (which were out of season). All were delicious, although the side order of pan-fried gnocchi won best-in-show. Almost everybody at the table ordered the Bronzed Rib Eye – Rigoletto’s signature steak – which is served with a honey jalapeno butter sauce, the gnocchi, and creamed spinach. To be different, I tried their AAA Tenderloin, served in a mushroom, brandy, and red wine sauce, with the creamed spinach and some angel hair pasta on the side. The tenderloin (and its delightful sauce) was every bit as tasty as the rib eye and was cooked perfectly, each bite a tender explosion of savoury, wine-infused flavour. Don’t worry, though – Rigoletto’s is every bit as good at cooking pasta as they are at grilling steaks. My angel hair was some of the best I’ve ever had. You can always see a restaurant’s skill in Italian cuisine when they can take something so simple – angel hair tossed in garlic and olive oil – and make it so delicious. Each dish was generously apportioned, the service was excellent, and the restaurant had a comfortable, minimalistic ambience appropriate for a family meal, a date night, or a large group of friends. Their house wine is also ridiculously cheap ($15/half litre); the red is a Cono Sur Cabernet/Merlot, the white a Pinot Grigio. Despite the fact that Rigoletto’s was only half-full during a Saturday evening dinner rush, it’s clear that the restaurant’s delicious food, homey atmosphere, and friendly service have kept regulars and newcomers alike returning for yet another taste of Italian authenticity. We have all had a good steak. Face it, the “I love Alberta Beef” rings true in all of us, but what sets apart a good steak from a great steak? Ladies and gentlemen I give you the Bronzed Rib Eye Steak at Rigoletto’s Café. Rigoletto’s steps outside the norm by thinking outside the box, and stepping into a bigger box filled with flavour. There is no teriyaki sauce, sage butter, or garlic butter here my friends. Most places give you the same generic tastes governed slightly different from where the cow was born, raised, or fed. This is all cancelled out when the steak is rubbed down with Montreal steak spice and grilled to your liking. But wait, it gets even better! The marinated rib eye steak that is seared on the grill to your liking is coated with an amazing honey jalapeño butter sauce. The sauce is not overly spicy as the jalapeños are balanced by the honey to mellow the heat. While grilling, the sugars in the marinade caramelize into a sweet glaze enveloping the rib eye as the fat renders all around and crisps around the edges nicely. Add pan-fried potato gnocchi and tender crisp veggies and you have yourself a real steak dinner. The gnocchi, I would recommend an extra side order of to dip the sauce your steak leaves behind. As you cut into your first bite of steak it is tender to the touch. As this bite makes contact with your tongue the fat and sugars sizzle and melt into a delicious blend of happiness that evolves with every chew. As the tender bits of morsel pass, you are left with a bit of heat from the sauce which sets off the brain to repeat this process. When you awake from this temporary food stupor you realize the steak is gone, the vegetables are gone, and all that remain of your gnocchi are bits of parmesan cheese and chives. "20 years says it all"
"There's something to be said for staying power, particularly when it comes to the cut-throat restaurant trade. So raise a glass to Rigoletto's Cafe, a cosy Italian joint that I confess fell off my radar back in 1998 when it lost its lease on Rice Howard Way. The restaurant didn't stay closed for long. Partners Jack Flisiak and Sergio Turlione simply bided their time a few months and the reopened in new digs in the back of the old Mayfair Hotel on 108 Street, just south of Jasper Avenue. And if I didn't rediscover them there, many of Rig's regulars certainly did, including a friend at work who raves about the steak. Pasta clearly rules at Rigoletto's and chef Turlione loves cooking seafood, but the fare is not merely mamma's dishes from the old country. Turlione worked the grill at Bistro Praha and the Steak Loft prior to his Rigoletto's run and the school shows. There's a little fusion evident on the menu, a little twist on the usual Italian order of things—the aforementioned rib eye steak is a grand example. For a good combo table appetizer, try the feta paté and Italian sausages. The first is a blend of feta and cream cheese and jalpeño peppers, delivered with gherkins and a side of dry toast; the second a platter of grilled mini sausages served with a grainy Dijon mustard. Taken together, this spicy tandem packs some heat." A champagne breakfast on a beer budget isn't a tough feat to pull off, if you know how to do it. Case in point is finding first-class Italian food with a tasty selection that's of inverse proportion to the thickness of your wallet. Fortunately, Rigoletto's, located on 100th Avenue across from the Freemason’s Hall, is a great find. They serve family-style, hearty Italian food that is good to the palate and the purse. No matter what your taste in pasta is, Rigoletto’s will have something to suit. From baked lasagna or penne with chicken or a variety of pastas with seafood; the choices are plentiful. If you feel like select cuts of meat you’ve got your choice of steak, chicken, salmon and shrimp. There is also a good variety of salads, soup and dessert; most popularly, the delicate and delicious tiramisu. If you have a family reunion coming up, or just a special event, this causal and cost-effective restaurant will fit the bill nicely. They’ll also help organize special intimate dinners and corporate functions as well. 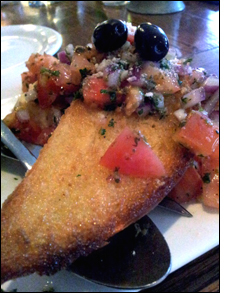 Rigoletto’s has great food, a good wine list, and won’t break the bank." As a staple of the standard operatic repertoire, it appears as number nine on Opera America's list of the 20 most-performed operas in North America. On his way home that night, Rigoletto broods on Monterone's curse. Rejecting the services offered by Sparafucile, a professional assassin, he notes that the word can be as deadly as the dagger. Greeted by his daughter, Gilda, whom he keeps hidden from the world, he reminisces about his late wife, then warns the governess, Giovanna, to admit no one. But as Rigoletto leaves, the Duke slips into the garden, tossing a purse to Giovanna to keep her quiet. The nobleman declares his love to Gilda, who has noticed him in church. He tells her he is a poor student named Gualtier Maldè, but at the sound of footsteps he rushes away. Tenderly repeating his name, Gilda retires. Meanwhile, the courtiers stop Rigoletto outside his house and ask him to help abduct Ceprano's wife, who lives across the way. The jester is duped into wearing a blindfold and holding a ladder against his own garden wall. The courtiers break into his home and carry off Gilda. Rigoletto, hearing her cry for help, tears off his blindfold and rushes into the house, discovering only her scarf. He remembers Monterone's curse. ACT III. At night, outside Sparafucile's run-down inn on the outskirts of town, Rigoletto and Gilda watch as the Duke flirts with the assassin's sister and accomplice, Maddalena. Rigoletto sends his daughter off to disguise herself as a boy for her escape to Verona, then pays Sparafucile to murder the Duke. As a storm rages, Gilda returns to hear Maddalena persuade her brother to kill not the Duke but the next visitor to the inn instead. Resolving to sacrifice herself for the Duke, despite his betrayal, Gilda enters the inn and is stabbed. Rigoletto comes back to claim the body and gloats over the sack Sparafucile gives him, only to hear his supposed victim singing in the distance. Frantically cutting open the sack, he finds Gilda, who dies asking forgiveness. Monterone's curse is fulfilled.